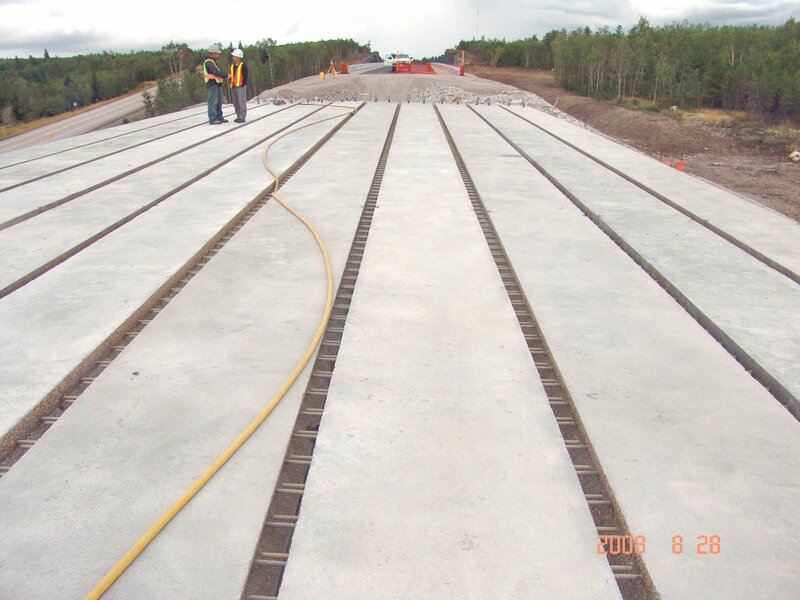 The Hawk Lake Bridge, owned by the Ministry of Transportation of Ontario (MTO) is located over an existing CPR Rail Line, about 40 km east of Kenora. The original underpass was built in 1935 and for decades, routing of the highway under the rail line restricted movement of commercial trucks that exceeded clearance height. The new bridge had to be situated over elevated train tracks that used to be over the top of the previous highway. With traffic moving over the railway on a two km section of new highway, it no longer has height limitations and more than 3,600 vehicles (25% heavy trucks) now use it every day. The new bridge (13.8m wide x 27.2m long) has 12 side-by-side precast box girders with 11 Ductal® joints, approach slabs and guardrail curbs. All precast elements were produced by Lafarge Precast/Winnipeg. The Ductal® Joint Fill solution enabled the designer to create optimized solutions for advanced precast bridge systems with simplified precast panel fabrication and installation processes - resulting in improved tolerances, reduced risk, increased speed of construction, cost savings and a more durable, longer lasting bridge deck solution. According to Ray Krisciunas, P.Eng., Head of Structural Transportation for MTO - "Ductal® has provided us with an entire new way of constructing bridges quickly and with guaranteed long term performance. Its extreme high strength, durability and ductility have opened up to applications that simply would not be possible with other materials. Most notable has been its use in field joints for prefabricated components. 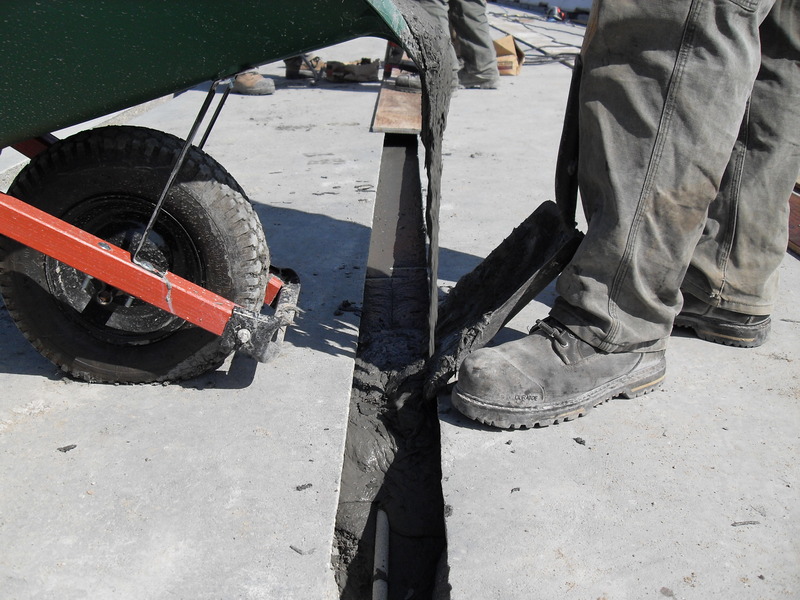 As well, Lafarge has been extremely helpful in providing technical support concerning the use of Ductal®." 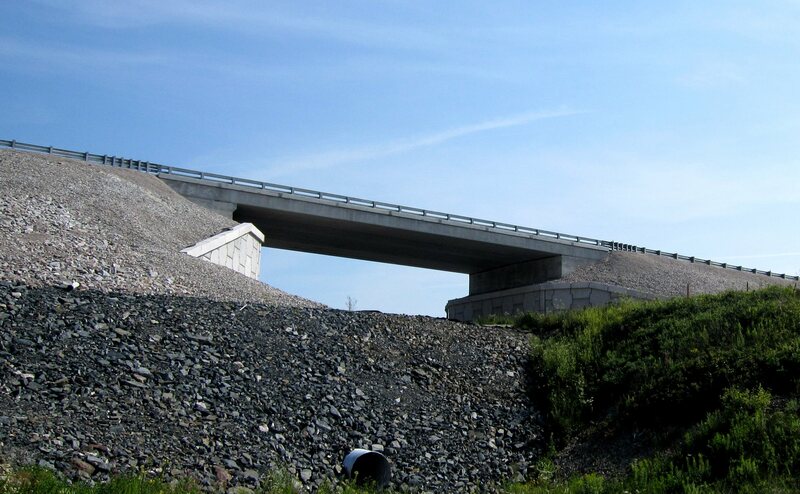 In 2010, this project won a PCA Concrete Bridge Award -- a biennial competition that recognizes excellence in design and construction of concrete bridges.